Are you comfortable with online banking? Home › Banking › Are you comfortable with online banking? Recently, on the Alberta Primetime Money Panel, I was asked how comfortable Albertans and Canadians were with online banking. Personally, I am very comfortable with technology and online banking. I think cell phones and tablets and faster internet have made it easier than ever for people to manage their finances online or through some forms of tech gadgets. Informally, I poll people in my workshops about online banking and 75% of the people bank electronically. The younger the person, the more likely they are to do some online banking. But I wanted to go beyond my experience and informal polling so I thought I would start a formal poll and share some data from a few different sources. I remember 15 years ago, there was a lot of concern over the security of online banking from my clients and the general public. Today, those same concerns exist. An Ipsos Reid study says that 83% of people who bank online are still concerned about identity theft and security. According to Statistics Canada, Canadians who had used the Internet for five or more years were less likely to be concerned about online security than those with fewer years of online experience. Of those who reported using the Internet for less than five years, 55% were very concerned about online credit card use and 50% about banking over the Internet. The majority of Canadians (63 per cent) report using online banking in the last year and nearly half of Canadians (45 per cent) today use the Internet as their main means of banking (up from only eight per cent 10 years ago). Although these concerns exist, it appears convenience has overcome people’s fears because online banking usage continues to grow. 82 per cent of Canadians say technology has made banking more convenient. 44 per cent say they value the ability to access their accounts anywhere; 15 per cent value the ability to bank when it is convenient for them; and 25 per cent say they do less running around which saves time and money. What do people use online services for? And, one of the growing online uses in the financial industry is applying for credit cards, mortgages and investment accounts. The majority of Canadians who visit their banks’ website say they check their account balances (92 per cent), pay bills (85 per cent) and transfer funds (76 per cent). 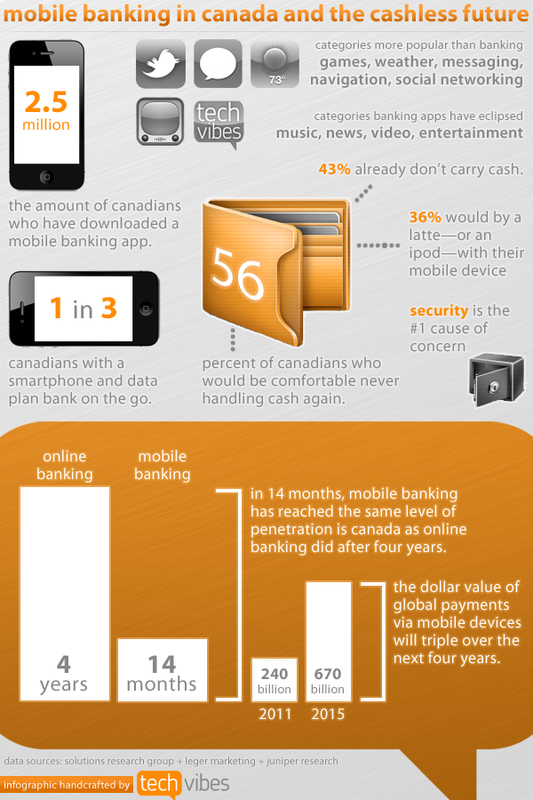 Mobile banking is still in its infancy with only 5 per cent of Canadians reported using mobile banking during the last year. According to a survey by KPMG, only 19 percent of Canadians feel comfortable using their mobile phone for financial transactions. The same survey found that just 8 percent of Canadians had made a purchase using a mobile phone which is significantly less than global consumers at 28 percent. Interestingly, in China, 77 percent of respondents say they have used their mobiles for banking and 44 percent for retail transactions, while in India 38 percent are using them to shop and 43 percent for financial business. This sector of banking should continue to grow as cell phone and tablet technology continues to improve. Consumer concerns over privacy and security are also pivotal to the continued adoption of e-commerce and mobile commerce. You can’t talk about online financial resources without talking about security and safety. Since 1996 banks have spent more than $56 billion to ensure the Canadian banking system is accessible, convenient and secure. The most common activities for ensuring safety and security of online transactions are PIN protection, use of secure websites and checking bank statements. More than nine-in-ten (93 per cent) report the use of anti-virus software, while more than eight-in-ten (85 per cent) use firewalls. 78 per cent of Canadians use anti-spyware. ← Annuity Math: Are life annuities a good deal? 6 Responses to Are you comfortable with online banking? 100% fine with it. I actually do most of my banking on my mobile phone! For day-to-day purchases, bill payments and email money transfers,you can’t beat the simplicity and convenience. I can’t imagine life without online banking. It’s so easy and fast. I must admit I haven’t really gotten into mobile banking – but I did just get my first Smartphone last year! 🙂 I’m not sure why people are so worried about security – you’re way more likely to have your account compromised when you use your debit card then when you use online banking! Yes I am comfortable with online banking. It is so easy and secure. I hope all of guise are agree with me. I would not be without my mobile phone, Vital for me because I run a business.